Jamaica’s double Olympic 200 metres champion Veronica Campbell-Brown is planning to race during the 2010 indoor track and field season. 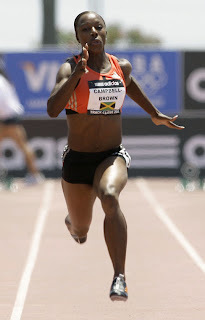 Campbell-Brown, who was slowed down by a bothered by a toe injury throughout the just concluded 2009 season, will also use the races to decide whether to compete at the IAAF World Indoor Championships, which will be in Doha, in March. The last time the Jamaican and Caribbean sprint queen competed indoors was in the 2006 campaign where she ran a personal best of 7.04seconds for the 60m and a creditable 22.83 over the 200m. The 27-year-old is in France where she received her award for officially named UNESCO Champion for Sport Ambassador at Paris Headquarters. She was nominated by the Minister of Youth, Sports and Culture, the Honourable Olivia Grange, MP, will take on the mission of Gender Equality in Sports. Minister Grange will attend the ceremony. The Minister, who has responsibility for Gender Affairs, pointed out that Veronica’s mission is a significant step for global gender issues. On receiving her award, Campbell-Brown used the moment to urged other sportswomen to use sports as a tool for peace and development.